Voice mail broadcasting is a modern communications technique that delivers recorded phone messages to both voice mail systems as well as individual call recipients. Database Systems Corp. (DSC) has been a leader in providing contact management technology since its inception in 1978. This technology includes automated phone systems and computer telephony software. DSC provides voice mail broadcast solutions which includes call processing capability that is integral to automatic call center phone service. Likewise, DSC provides advanced voice mail broadcasting solutions for call centers and organizations needing to get phone messages out quickly. Automatic phone message delivery systems can send voice mail messages to your employees and business associates or can have calls directed to internal customer assistance representatives or to outside phone numbers. Our IVR (Interactive voice response) can be embedded in these recorded messages allowing the call recipient to make touchphone selection using the telephone's keypad. The New Jersey Nurses Union utilizes our voice broadcasting services to contact its members for meetings and other general announcements and event reminders. 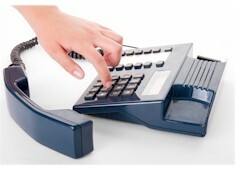 DSC offers voice mail broadcasting systems for both small and large marketing applications. This modern call center phone system includes a Windows PC with Dialogic computer telephony cards. When combined with our full-featured voice marketing software, these phone systems can perform both inbound call distribution as well as outbound voice mail broadcasting campaigns. The WIZARD voice broadcast system is our entry level voice message delivery system that broadcasts phone messages using up to 48 analog phone lines. If your message broadcast center requires faster delivery to a large number of households, our PACER voice broadcasting system can be used to deliver messages over hundreds of digital phone lines. Besides offering an industry leading voice mail broadcasting system, DSC provides voicemail broadcasting services using our own secure call center. In most cases, your voice mail applications can be developed and running on the same day. Our online message broadcasting is a self managed program that lets you maintain your calling programs using our secure website. Customer lists and voice recordings can be downloaded via the web to our call center and your phone campaign can be initiated online as well. For voice broadcasting service, we even provide an 800 number to call to launch an emergency broadcast to your employees or community. Contact Us Today to learn more about our voice mail broadcast technology.